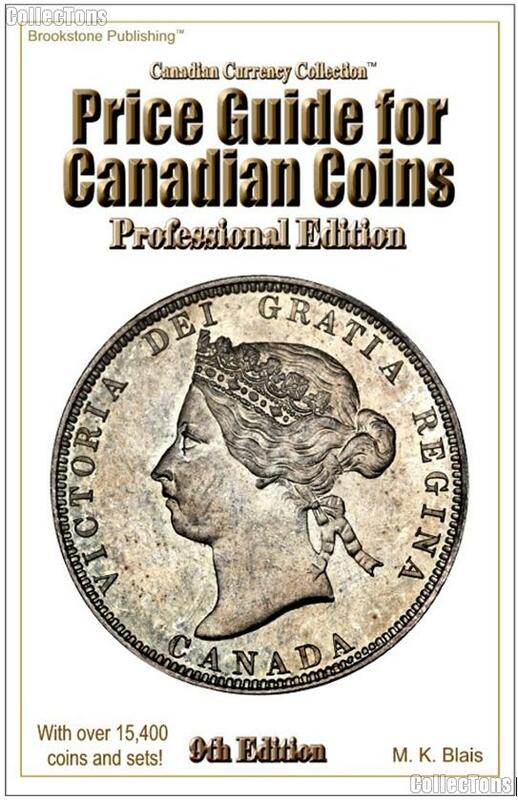 We are pleased to offer for sale this Price Guide for Canadian Coins Professional Edition 9th by M.K. Blais. This 620 page paperback is a comprehensive guide to Canadian coins. Over 13,500 listings representing more than 15,400 different coins and sets using nearly 129,000 price points. Listings and pricing for over 9,000 business denomination coins from 1 cent to 2 dollars. Listings and pricing for over 3,200 collector coins and sets including bullion coins, gold collector coins and after market coins. Listings and pricing for nearly 750 provincial coins and sets dating from 1823 to 1947. Listings and pricing for over 600 error coins dating from 1852 to 2009. Listings and pricing for nearly 1,600 Tokens dating from 1670 to about 1893. Pricing for High Grade coins in MS, PL and SP condition; with grades up to MS66, PL68 and SP68. A chapter called ‘Finding Value’ – designed to help collectors find value in the market place. A section called ‘Value Comparison Tables’ that helps collectors compare the value of coins with each other. A section that contains the change in basic coin prices from the previous issue of this guide to the current issue. Two appendices to quickly identify tokens, their Breton Numbers, and the section their pricing can be found.